I generally don’t eavesdrop and snoop around coochie-coo couples but this was more like in the face. I fail to understand this so-called-maal-kaalchur and therefore we goto our resident genius philosopher the one-and-only ‘Baba Bangali’ who is second only to the ‘Great Gounder‘. In my quest for knowledge to ensure that I am not ill-prepared and caught in a maal kaalchur crisis, I humbly ask the great baba. Baba, What does the Europeanness of a brand have to do with its likeability? Bhakta, For this you will need to understand the mind of a woman. Anything from foreign shores rakes up value. After all that four-feet something Fuhrer was also European and people still go ga-ga over the Beetle just because that midget drove it! So you see my dear Bhakta, Puma is German and so were the Nazis. I hope you remember that the founders were part of the Nazi party before they split. The woman in question is actually an undercover Nazi agent and the phrase you heard is a coded sequence to reach out to fellow Nazis. So its not about her choice of garment nor is it about the brand nor its origins, it’s all about locating fellow Nazis so that they come out of hiding. Baba, Then what about real men wearing pink? I also observed that stores are stocking only light colors like yellow or pale green and light blue! gigantic proportionstomorrow it will snowball into a catastrophe of gigantic proportions. Today they take away your choice to buy a solid color shirt, tomorrow it will be your choice of beverage, favorite snack, gadgets and even cars. Imagine a time when they will control you and your life would be restricted to a pod and thousands of you will be grown in farms! 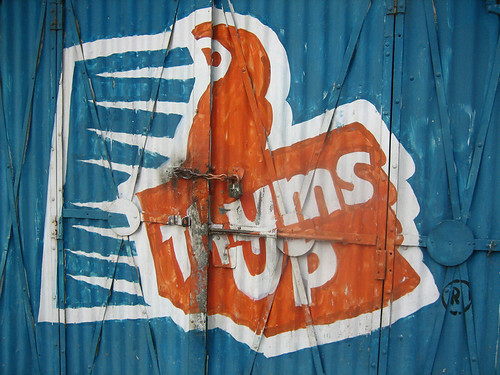 I had to drive to the AP border to smuggle my favorite ‘Thums Up’ into Chennai. Is there something I am missing here as well? Wonderful observation Bhakta, You may note that ‘Thums Up‘ is currently endorsed only by Khiladi Kumar and Megastar Chiru. It enjoys a handsome portion of the market share in AP but the lack of an ambassador seems to have driven it out of the market in TN. But Bhakta, this is something even a nincompoop like you can figure out. So let me give you a low down on the rivalries in Kollywood. When Coke signed Vikram for the Tamil version of its Aamir Khan ads, it also got Vijay on board to woo the masses. Pepsi on the other hand had Madhavan and Surya doing the SRK-Saif ads. This left only the also-rans who were begging to be signed up so that they could hop on to the endorsements bandwagon. So now unless our favorite ‘Roachstar‘ steps in and quenches the thirst of ‘Thums Up’ lovers in TN you will have to adjust with either Coke or Pepsi for your Rum. LOL did that woman really say, ‘So European?’ OMG! Too much man…but not all women are like that ok? me: I was very tempted to ask her to kindly explain! Heh! How dare she? The guy should have responded something on the lines of “Nike is better, so American!” Cha, why the blank face? Because this wouldn’t have led to any back story like the Nazis? Apart from offering sheer exoticism, European mass market fashion also breaks with the monotony found in American mass market fashion a la Nike or the Gap (incidentally, Gap made for Europe is marketed as Banana Republic in the States, and is targeted towards a more upmarket crowd.) So, a person who wears European clothes is considered by a lot of fashion-conscious young Americans to be more trendy/ fashionable than one that wears the local flavor that everyone else is wearing. Incidentally, I’ve also observed that Americans tend to consider edgy/ fashionable (or even weird) stuff “European,” regardless of its source. For example, you could wear a pair of skin-tight bold colored Levis with some purple cowboy boots, and young Americans would call it “European” style! me: read your post on style, I prostrate in front of you! Have you ever noticed that its the bimbettes who are committed? me: Have mercy on the lesser mortals, for all are not genetically engineered for superior cranial density like you. Seriously, whats with Chennai and pale green shirts dude?!! I spent almost one and half hours in City Center, only to see these f*cking green shirts all around. Saniyan! It is nice for a city to turn ‘green’, but surely not this way. Intelligent guys dont date too, if you dint know that already! me:blame it on our matinee idols, that is what they wear in their office-goer roles…. Have you ever noticed that its the Mimbettes who are committed? me:if intelligent guys don’t date and intelligent girls also don’t date. Then that leave only stupid people to date. Appo how do we find intelligent people? So if you’re single, you’re intelligent! What does that make married folks like me who wonly buy size XL clothes in beige and grey? No, all the smart, intelligent, single PYTs please don’t answer…. I am going to the Marina to drink salt water in a steel tumbler! me: maami, you are a class apart! I’m more talking about daily wage labourers like us who buy light green and yellow for aapees! annathe!!! Ethu enna poyi!! indha pachangala!!! indha ponnuga padhuthara paadu!!! Ennaku namma Karakattakara hero thaan nyabagam vandharu! enaka shoka irupaaru!!! Annathey! ENakku Ramarajan thaan nyabagam vandharu! edhum oru fashion. epothiya fashion.Kaallam !!! Baba Bangali oda darshinam kedachathuku! romba santhosam!!! me: ha ha ha, I’m humbled! Boytoy? LOL! None of my friends actually like pink on men. Madras la summer heat might have gotten to her. And i loved Jaane Tu. Sooooper movie.